Tehachapi Moose Lodge at 123 W F. St. will be remodeled for all types of events. The previous location of First Interstate Bank at 123 S. Green St. will now be the home of Stray Leaves Tasting Room, serving wine and appetizers. This is the future site of three businesses: Tehachapi Academy of Dramatic Arts; Lucky's Barber Shop, which will move from its current location; and the executive office of Big Sky Dwellings. This is 301 S. Green St. The former St. Vincent de Paul thrift store on 122 S. Green St. is currently in escrow. World Wind & Solar’s new downtown headquarters is making progress as permits have been approved by the city to start remodeling the old Ace Hardware location at 228 Tehachapi Blvd. Several downtown buildings are being purchased and remodeled for new or existing businesses. The changes to these buildings — some of which have sat vacant for years — was the main topic of Wednesday's Tehachapi Economic Development Council meeting. "You must have a healthy downtown and we are very excited," City Manager Greg Garrett said. “We are really excited to have all our permits, to bring our team downtown and construction is moving forward,” said Nikki Cummings, president of World Wind & Solar. The building has to be brought up to code as it’s made from unreinforced masonry. It has trusses inside the building, insulation and large windows on the north side of the building will be added, said Cummings. Cummings added the goal for occupancy and opening is early 2019. While other businesses didn't present at the EDC meeting, several shared their plans in an interview with Tehachapi News. Stray Leaves Tasting Room at 123 S. Green St. will serve wine and appetizers and has been approved for permits to begin remodeling the building that used to be a bank. The enhancements to the building are slated to take eight to 12 months, owner Clifford Meridth said. Tehachapi Moose Lodge, at 123 W F. St., will be remodeled for an event center and potentially a Mexican restaurant, said new owner Rudy Ramirez, a recent Tehachapi resident. 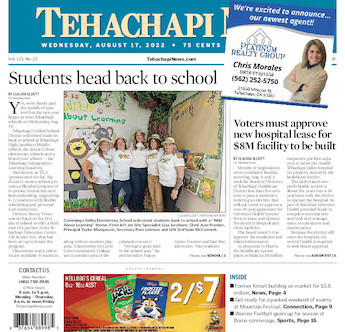 The improvements go before the Tehachapi Planning Commission on Sept. 10 for approval. The future site of three businesses — Tehachapi Academy of Dramatic Arts; Lucky's Barber Shop, which will move from its current location; and the executive office of Big Sky Dwellings in a separate dwelling on the property— will be 301 S. Green St. The building will be separated into different spaces to accommodate the businesses, said owner Ryan Beauchamp. There will also be another office space separate from the main building. The former building that once was St. Vincent de Paul at 122 S. Green St. is currently in escrow and no information is available on the identity of the owner or future plans of the building.